Defense Minister Avigdor Liberman spoofs British Jewish comedian's parody of Israeli counter-terror expert with his real-life inspiration. Now, Israel’s security establishment has returned the favor, spoofing Cohen’s parody with its own commando-turned-reality TV star. 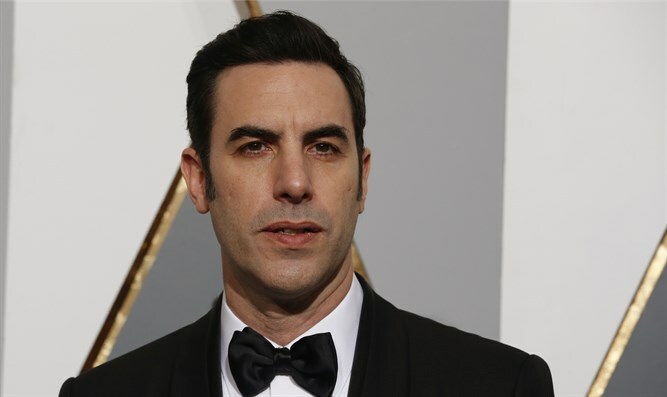 Cohen, 46, first gained fame – or infamy – with his characters Ali G and Borat Sagdiyev, which first appeared on the TV show “Da Ali G Show” before being featured in the films “Ali G Indahouse” and “Borat”. Luring – though not always successfully - unsuspecting guests – including Donald Trump, former House Speaker Newt Gingrich, former Texas Congressman Ron Paul, former United Nations Secretary-General Boutros Boutros-Ghali, and consumer protection activist and former presidential hopeful Ralph Nader – into absurd conversations Cohen was forced to retire his primary characters. Earlier this year, however, Cohen returned with his new series “Who is America?”, with a lineup of new personas, including Erran Morad, who poses as an ex-Mossad agent now working to train celebrities in self-defense and counter-terror techniques. The character is widely believed to be based on the real-life former IDF special operations officer Matan Gavish, who now runs a self-defense academy in New York. In a video released via social media Tuesday, Israel’s Defense Ministry spoofed Cohen’s ‘Erran Morad’ persona. The video, sent with a holiday greeting for IDF soldiers ahead of Rosh Hashanah, features Gavish and Defense Minister Avigdor Liberman, and includes nods to some of Cohen’s more outrageous skits under the guise of ‘Erran Morad’. Unlike Cohen’s guests, however, Liberman easily sees through the deception, mocking Gavish’s outrageous suggestions.